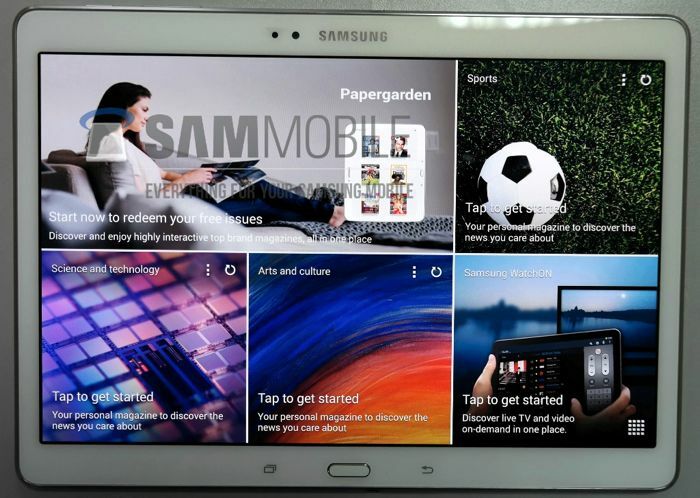 We’ve seen a plethora of leaks about the upcoming Samsung Galaxy Tab S AMOLED tablet. The device has posed for the camera a number of times in the past, showing us its beautiful display. Recently, a new firmware for the alleged tablet was leaked, which also revealed some of the feature the tablet is rumored to come with. A new report suggests the Galaxy Tab S will come with a fingerprint sensor as well as the Ultra Power Saving mode, similar to the Galaxy S5. The device is not a secret, it has popped up on a retailer as well, along with the price tag it will come with. Samsung has scheduled an event on June 12th, where the Korean OEM is rumored to launch the Galaxy Tab S.
The tablet is rumored to come in two versions: 10.5-inch and 8.4-inch. Both tablets will sport a resolution of 2560 x 1600 pixels and will come with and octa-core Exynos 5420 SoC with 2/3GB of RAM. On the rear, it is rumored to come with an 8MP camera for photos and videos as well as a 2MP front-facing camera. It will also come with LTE connectivity and Android 4.4.2 KitKat as its operating system with the new Magazine UX.